“Thou shalt not clog the bases,” declared the Dusty one! No, it isn’t difficult to understand, but Dusty Baker is completely baffled by the concept. How many runs has this cost the Reds over the last 2+ years? The answer is: too many. This team struggles with offense as it is; they don’t need Dusty putting them further behind the 8-ball with his lineup shenanigans. *I like Stubbs, and he isn’t going to be this bad over the long haul, obviously. He is likely to develop into a decent leadoff hitter, and that’s the difference between Stubbs and the two other names. Up to this point, however, he’s been awful. To be fair… Who is Dusty going to hit in the leadoff spot? How would you construct the lineup without Stubbs leading off? If it’s not Stubbs then you’d figure Dickerson who hasn’t hit any better really. If the answer is nobody is better who is currently on the roster, then that’s Walt’s issue not Dusty’s. @Chad Dotson: That’s a great answer and one I haven’t had the guts to post on. But yeah: Hannigan, Rolen, Votto, Bruce, Phillips, OC, Gomes, Stubbs, would work for me. Last year at this time Willy’s #’s were .264/.330/.330 and it was all downhill from there. No, I think Stubbs has at least a 90% chance of finishing w/ better numbers than Fast Willy. Stubbs takes more walks and has clearly more power, so really all he has to do is hit like .200 or better, I’d say, to be better than Willy. Literally. And I think he’ll get it back to at least .240 or so. That’s my guess anyway. I’ll play devil’s advocate for a minute. Speed, while not as important as Dusty makes it seem, is important at the top. Stubbs can score on only one hit with either a single (after a steal of second) or a double. With Hanigan’s speed, Hanigan won’t steal a base or score from first on a double. Hanigan needs at least two hits to score. This assumes we aren’t wasting an out on a sacrifice. I’m wondering if statistically Stubbs has a better chance to score than does Hanigan despite having a lower OBP by .150. The difference between the three players (so far) is obp/avg ratio. If Stubbs can bring up his average to .240, his obp would be .340. He had a better avg and obp in the minors, and I think he’ll be a fine lead-off hitter. I’m not sure why the batting lower in the order thing only stuck for one day, but now you have the issue of Dickerson on the DL. I don’t know that you put Heisey in LF batting leadoff, but I’m not sure who else you go with. I think if someone scribbled an “f” next to the “c” on the back of Hanigan’s baseball card, he would hit leadoff. Pretty much any option would be better than .242 obp. It wouldn’t surprise me to see Phillips elevated to #1, Cabrera back at #2 and Stubbs dropped to 7th/8th. How about Baker’s most recent lineup, with Stubbs down and sliding everyone up a notch. 1. Catching is already rough on the knees, having a catcher batting lead-off is another strain on said knees. Not a good idea long-term, so why bother in the short-term. 2. Take a look at the disparity between BA and OBP for each of the aforementioned. One of these is not like the other, in a good way. When Stubbs brings his BA up to around .250, he will likely have an OBP above .350. Stubbs will turn it around; his current .230 BABIP virtually guarantees it. I’m not sure how leading off is more of a strain on the knees. You may have to explain that one to me. IÃ¢â‚¬â„¢m not sure how leading off is more of a strain on the knees. You may have to explain that one to me. He would get more at-bats leading off. But I’m not sure how hard that would be on his knees. I like your lineup a lot Greg, but I’d flop Gomes and OCab. @Chad Dotson: More ABs per game with more importance placed on getting on base, rather than driving the ball, therefore leading to more time spent using the knees, hence more stress on the knees. Usually you want the better athletes, with better legs and speed, at the top of the order, and Hanigan is not one of those. It may not show up in the short-term (100games), I believe it would be an issue. I could agree with Phillips batting lead off we dont have many options but you would have to slot Votto in the 3 hole and move OC to 2.
and just to opine a little further, this Heisey marinating on the bench bugs the hell out of me. Talk about someone who should be getting regular at bats whether it’s at the MLB level or AAA level. If you had such little faith in him in the first place why call him up. Why is Cairo still with this team? He’s eating a 40 man roster spot and offers absolutely nothing. Yes I know he’s probably a great clubhouse presence. There’s little ways this team could improve itself and it’s depth that just keep slipping by everyday. It’s like the BP situation. Next year his contract goes to 11 milllion dollars. I’ve seen others write that fangraphs had BP as a 15 million dollar player last year. In what universe is BP worth 15 million dollars. Show me the team that will be willing to pay him 11 milllion dollars next year, especially after all the little comments being leaked out about his popularity in the clubhouse. Everyday that goes by and he isn’t traded is another day his value to the franchise decreases. This team amazes me in it’s ability to hang on to someone just long enough for his value to lower to a level that getting a player like Sean Henry is considered fair value. Sorry for the rant, it’s been building for a little bit now. The dog will be happy now I won’t be kicking it nearly as often now. BP still has plenty of Value. His Defense at 2nd is among the best in the league and should have more than 1 gold glove. Last year he started just as slow and heated up. Trading him would leave us with a lot more holes than we are able to fill. If Heisly was going to be a starter he would have made the team out of camp. Of course he is going to split team with Nix and Gomes. IÃ¢â‚¬â„¢ll play devilÃ¢â‚¬â„¢s advocate for a minute. Speed, while not as important as Dusty makes it seem, is important at the top. Stubbs can score on only one hit with either a single (after a steal of second) or a double. With HaniganÃ¢â‚¬â„¢s speed, Hanigan wonÃ¢â‚¬â„¢t steal a base or score from first on a double. Hanigan needs at least two hits to score. This assumes we arenÃ¢â‚¬â„¢t wasting an out on a sacrifice. IÃ¢â‚¬â„¢m wondering if statistically Stubbs has a better chance to score than does Hanigan despite having a lower OBP by .150. The thing that youÃ¢â‚¬â„¢re forgetting about here is slugging percentage, and thatÃ¢â‚¬â„¢s why speed is overrated at the top of the order: because the guys behind the leadoff hitter are the most likely to hit for extra bases, when speed means less. Yes, Hannigan will need more bases hit behind him to score because he wonÃ¢â‚¬â„¢t steal, but that doesnÃ¢â‚¬â„¢t mean heÃ¢â‚¬â„¢ll always need more hits. They both score on a HR, get me? First the set up. Slugging percentage is bases per AB. Phillips (.431), Votto (.512), and Rolen (.515) are slugging behind the leadoff hitter, which adds up to a combined 1.48 bases that will be hit on average after the leadoff hitter gets on. For simplicityÃ¢â‚¬â„¢s sake IÃ¢â‚¬â„¢m going to say that half the time this will be 1 base, and half the time this will be two. In 100 PA Stubbs will get on about 26 times, and heÃ¢â‚¬â„¢ll steal about 8 bases. Half the time, or 13 times on base, 2 bases will be hit behind him, and heÃ¢â‚¬â„¢ll score. 13 times only 1 base would be hit behind him, and he wouldnÃ¢â‚¬â„¢t score, except that 4 of those times (half his steals) he would have stolen, so heÃ¢â‚¬â„¢d score there too. ThatÃ¢â‚¬â„¢s 17 runs (and close to the 16 heÃ¢â‚¬â„¢s scored to date, gotta love the back of the envelope). In 100 PA Hannigan (at his current pace) will get on about 48 times. Again, 24 of those times heÃ¢â‚¬â„¢d score because 2 bases were hit behind him, and 24 times he wouldnÃ¢â‚¬â„¢t because only 1 was hit behind him. ThatÃ¢â‚¬â„¢s 24 runs (Not even close to the 3 heÃ¢â‚¬â„¢s scored at the bottom of the order). Over the season that would be a difference of about 38 runs. Now thatÃ¢â‚¬â„¢s a lot of assumptions in there, not the least of which is an absurd .480 obp for Hannigan. Still, the margin is so wide, IÃ¢â‚¬â„¢m pretty confident in saying that at anything close to their current levels of production, Hannigan would score more runs from the leadoff spot than Stubbs. …..While your at it move BP to SS and Cabrera to 2B. Of course this line-up and the switch in the middle of the infield is taking in account that Janish is not on the team…Which for all intents and purposes he isn’t. Actually, I like Greg’s line-up also. 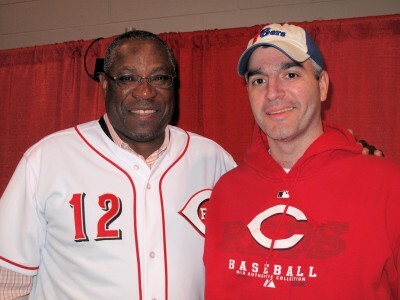 Dusty Baker is probably the last manager that would ever bat a catcher lead-off. It just not going to happen. Batting Hannigan Leadoff is just as asinine as batting Patterson or Tavaras……seriously the best idea out there is batting Ryan Hannigan Leadoff??? According to Fay, Dusty is going to make a change at leadoff (“rethink it”) and Stubbs has admitted publicly that he feels more pressure due to leading off. So this is going to happen for Friday nite’s lineup, and I’m going to view it as a guessing game. Dusty will want someone with speed so the realistic choice for leadoff would be Phillips. He’s batted leadoff before and I believe he even took more pitches when batting leadoff, though I don’t have numbers to back that up. I’m fine with BP batting leadoff as a temporary measure. Stubbs can return there after he gains more confidence. From there it’s easy to say what the lineup will be, at least against righties. Cabrera will bat 2nd because he’s a contact hitter (and a SS !). Vottto-Rolen-Bruce-Gomes will bat 3-4-5-6. From there I would bat Hanigan 7th and Stubbs 8th, but Dusty still thinks of Hanigan as a light hitter so it may be the other way around. This is essentially the lineup that Jeff posted, except flip-flop Gomes and Hanigan. Nothing like trotting out the ’nuff said argument on a discussion board. @Josh Rose: Close this thread! Someone has declared “nuff said”. I like that, Hanigan gets on base a lot and Cabrera would get more chances to drive in runs. But no way the Dusty one does it. Chad, this is totally unrelated to the topic, but I’m having serious trouble reading the posts and comments somewhere around the halfway point of scrolling down. The right hand column is pushing over into the main area and overlapping all the content there, making it very hard to read (let alone write this comment!). This has been going on for several weeks, so I’m guessing it’s simply a flaw in my connnection since I haven’t noticed anyone else point it out. I have never understood that Bakerism about “clogging up the bases”. What the #^(& does that even mean?? Isn’t the whole idea in baseball is to get on base? So how do you clog up the bases? Isn’t it up to the next batter to “unclog” the bases by driving them in? Baker is an idiot. That’s the only answer I can come up with. If his talent lies in managing all the egos on a team, great, make him the bench coach. Just don’t put him in a position where he has to talk to the press or form a strategy. As for what to do with Stubbs, I do believe he will work it out. And his fielding and running more than makes up for evrything else. But it would help if he had a better hitting coach who will actually come up with some solutions to the offense problem. For the whole team! How come it so obvious to us that the answer is simply to rearrange the batting order? In the meanwhile, our illustrious hitting coach or one of our great clubhouse guys needs to help Stubbs with pitch recognition. He seems clueless as to what he should be expecting. He’s like a bad guess hitter. This happens to me sometimes as well. I think Greg’s lineup makes the most sense. We really don’t have a good option for leadoff. Stubbs sometimes looks clueless at the plate and his defense hasn’t been all that good either. However, we all have to agree that he has MUCH more upside than Crappy or Willy T.
1. Someone (LIKE A HITTING COACH) needs to help him cut down on the strikeouts. 2. Stop hitting fly balls. He needs to let his speed help him get 3-4 moire hits a week. Get the ball on the ground. 3. Eric Davis should be hired full time just to show Stubbs the ropes out in CF. @wanderinredsfan: That explains why Rickey Henderson’s career was cut short at 25 years. @pinson343: Pre-season, Jim Bowden thought- and I agree – that Stubbs might be a nice fit in the #2 hole – thinking that he would get more fastballs that way and feel less pressure. @Plowboy: What browser are you using, Plowboy? …until tonight. This is the first time I’ve seen what you are reporting, and I was testing it on an out-of-date version of Internet Explorer. Make sure you have the latest version of your browser. The rest of my browsers are completely up to date, and I’ve never seen this issue. Late to this party, but here it is anyway. 1. Hanigan- best OBP .479, makes contact in 88% of PA. Hitting first in the order will not wear out his knees anymore than hitting in the 7th spot. It is one more PA/game. Never getting a day off and having bad knees in the first place will wear out a catcher’s knees. Also, see al’s comment (#16). 2. Rolen- good for a .350 OBP, will take a walk (10% of PA), contact rate of 86% (90% is ideal). Veteran presence, oh yeah, that is aware of the situation, i.e. can hit and run, sacrifice, take some pitches, or show some of that GABP power that he’s rediscovered. 3. Votto- our best hitter. VOTTOMATIC. .417 OBP, power, speed, starvin’ for RBI. 4. Bruce- second best hitter right now. Anyone watching the games this year can tell you he is locked in. Getting his pitch and driving it. 5. Phillips- I like him here based on unadulterated gut instinct. Just seems more comfortable lower in the order. That, and a very small sample size from 2007 in which he hit .364 with 2 HR and 7 RBI in 11 AB from the 5 spot. Plus, with the big guns ahead of him in the order, he can steal all the bases he wants. 6. Heisey (vs. LH), Nix (vs. RH)- give Heisey some chance up here and see how it plays out. He could take the job outright. Or Francisco, or Frazier. Nix is also above average defensively and won’t kill the team the way Gomes is out there. Best option in LF bats here. 7. Stubbs- here because if he’s 8th, he’ll see nothing to hit batting in front of the pitcher. Here because he can’t make enough contact (67% with 30 Ks) to stay at the top of the order. In the minors, he’s put together 450 AB with a 75% contact rate and decent BB/K ratios, so he’s capable of contributing to a big league lineup, just not yet. Can also steal as many bases as he wants to in this spot. 8. Janish- can he sustain his numbers at this disadvantageous spot in front of the pitcher? No. And he doesn’t have to. His glove will prevent runs from scoring in the first place. His hitting has progressed, and given the chance, Bat Boy in the lineup everyday would be an improvement. Ã¢â‚¬Â¦until tonight. This is the first time IÃ¢â‚¬â„¢ve seen what you are reporting, and I was testing it on an out-of-date version of Internet Explorer. Same experience here. I’ve no had no problem with the 3 browsers mentioned, but then used a friend’s computer with an old version of IE, and for the first time saw what people have been talking about. I could only post by writing my comment in a text file and doing a copy/paste. 2. Stop hitting fly balls. He needs to let his speed help him get 3-4 more hits a week. Get the ball on the ground. It’s definitely a matter of getting him to use his speed. First he needs to learn to bunt. He tried one the other day, on a pitch right over the plate, and completely missed. Even pitchers don’t completely miss on a bunt. His biggest problem right now is making contact. I remember at one point during his minor league career, he was striking out a lot, and they had him shorten his swing. He had great results right away, striking out a lot less, while hitting for less power. It’s possible that – with his hitting for power when he came up last year – he’s gotten carried away and has gone back to his longer swing. He tried hard as leadoff hitter to work the count, and that’s been a disaster. He takes too many strikes, including way too many called 3rd strikes. Anyway, he should work hard on his bunting and probably shorten his swing (Jacoby, do you know what you’re doing ?). Mainly he needs to relax. I feel sure his defensive problems are due to his confidence being shaken. @Barnes: I like your best case lineup. Note that for a lot of the lineup, it’s the position that matters, not the player. Pinson, I’m in total agreement. Stubbs is going through a confidence crisis. @Barnes: I like that lineup, but it will never happen under DB. I’m not ready to bench Gomes for Heisey just yet. I like Heisey long term, but he has looked absolutely silly in his ML at bats so far. @Chris Garber: How does that comment have anything to do with a catcher batting lead-off? @wanderinredsfan: You said batting leadoff was an additional strain on the knees. If rule applies only to catchers who bat leadoff, I can only offer you Jason Kendall, who batted leadoff (and caught) a million games a year, forever. you imagine him batting leadoff and getting on base at nearly a .380 clip? That would be a dream. You know what is really sad…Dusty doesn’t want to use Phillips there because of his OBP, but he has run this trio out there the past three seasons. I am not advocating Phillips to leadoff, but come on Dusty, why look at his and not these three.